Often, in terms of bass fishing techniques, what goes around comes around. Such seems to be the case lately with one of our basic shallow-water staples, the spinnerbait. Until recently, spinnerbaits fell off the map, driven out first by square-bills and later by the wildly popular bladed jig. Recently, however, spinnerbaits are again being slung through the shallows when big money�s on the line. Such was the case with the recent FLW Tour event on Grand Lake. Nearly all the top finishers listed a spinnerbait as their top choice. Sure, Bryan Thrift leaned more on a ChatterBait, but he�s on another planet when it comes to fine-tuning a lure choice. 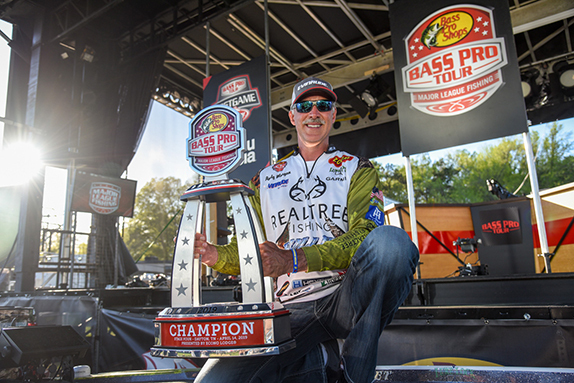 For Jeremy Lawyer, the event�s winner, the spinnerbait was an easy pick. Lawyer�s been slinging blades since he first learned to cast. �I think my daddy tied it on my rod because it wouldn�t get hung up a lot,� Lawyer chuckled of his earliest experiences. Since that time, Lawyer has fashioned a part-time fishing career building, tinkering with and fishing spinnerbaits. When I inquired of his reported ownership of truckloads of blades, he neither confirmed nor denied. It�s true, nothing gets by Jeremy Lawyer in terms of spinnerbaits and the intricacies of their make-up. Crafting his own homemade lures began his education. In fact, during my conversation with Lawyer to learn more, perhaps no detail was stressed more than a spinnerbait�s framework. He talked about the difference between standard stainless steel and spring-tempered wire, and the unique design of his favorite Freedom Lures model. It�s this mega vibration that Lawyer first starts with in cold, dirty water. �Around here (the Ozarks), the bass like more vibration in pre-spawn; a perfect example is the Wiggle Wart,� Lawyer added, ensuring his spinnerbait choice can be felt from far away. 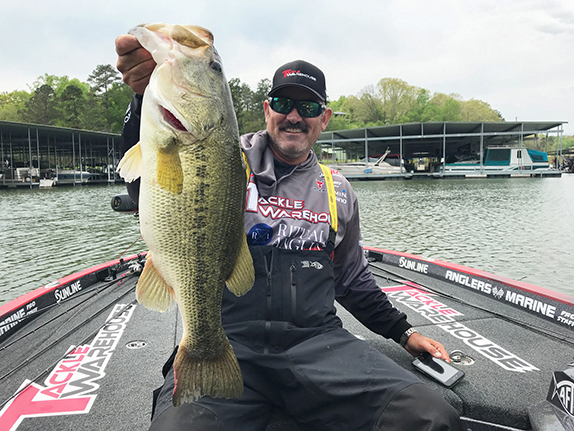 In fact, Lawyer commonly uses a spinnerbait much heavier than the competition for the same reason, as evident in his recent win, where he employed 3/4- and 1-ounce versions despite fishing the backs of boat docks. By increasing his lure�s weight, Lawyer is able to employ magnum blades (his initial combo at Grand featured a No. 3 1/2 and a No. 6 Colorado), yet still fish the bait quickly without worry of it rolling over. Such produces a rod-rocking pulse on the retrieve. Lawyer strictly chooses Hildebrandt blades and relies on five finishes: gold, silver, red, chartreuse and white. I was very intrigued by his preference of colored blades, once a craze that seemed to have burnt out over the last decade. �I�ve been going along with painted blades the whole time,� Lawyer remarked. Not surprisingly, his reasons were based on observation. �It�s a dull flash versus a big flash like a mirror,� he said �It�s definitely duller and a little more relaxing, so to speak.� Lawyer commented that the less-intrusive painted blades can be key to pressured fish. Lawyer painted his own blades initially, but now strictly relies on Fallcreek Lures to do the dirty work, as �they keep the paint as thin as possible.� Lawyer noted that his color choices can vary incredibly form hour to hour, often considering multiple shades of the same color to best match conditions. �You say chartreuse, and I say chartreuse, and they may be different altogether,� he added. Lawyer�s tight specs don�t stop at frames and blades. Skirts are equally considered. The spinnerbait fanatic relies on a �Hildebrandt two-stage� skirt (a machine-weld type featuring extra-long strands that allow for custom trims), because they push up against the lure�s head well, and really flare when Lawyer changes up his retrieve or hits an object. Trailers are considered, and tweaked, as well. �I started (at Grand) with a big swimming fluke,� Lawyer said, �because it really floats the bait, so I can go slow and the bait stays up.� As the event wore on, however, Lawyer fished deeper, changed to willow blades and lost the trailer. Again, considering Lawyer's whopper lure size, magnum blades and bulky trailer choices, it�s evident he targets big bass. �Yeah, I knew I�d be keying on 4-pound or better fish for the whole tournament,� Lawyer reflected on Grand�s stout population..
A few final intricacies of Lawyers spinner system blew me away. �I want as small of a swivel as possible, so the blades can spin it really, really easy. And the cheapest, lightest split ring I can find.� Lawyer reflected that, just by choosing a junker ring, the blades have less resistance to continue their dance. It�s mind-boggling to consider everything going through Jeremy Lawyer�s head when he opens up his spinnerbait box. However, it�s obvious such an attention to detail is imperative to excel in a sport where everyone seems to know the secret lure. 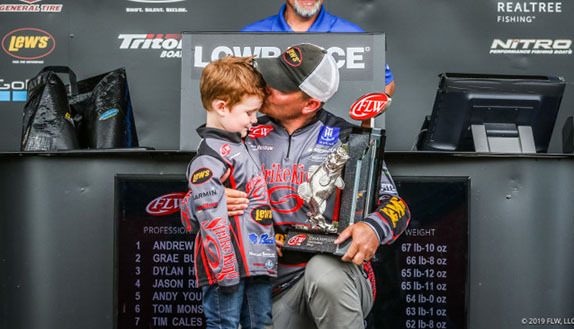 From Hank Parker opening our eyes to Indiana blades, to KVD showing the world painted willows, to Jeremy Lawyer ensuring we all dig back through our stock, the best in the business continue to bring our attention to what may still be our best choice.